The Garmin Forerunner 310XT is a GPS-enabled training device that will work for athletes who travel both on land and in the water. On land, it can track the time, distance, heart rate, and pace of your bike ride or run, and it will time your swim and give an estimation of distance and average speed. 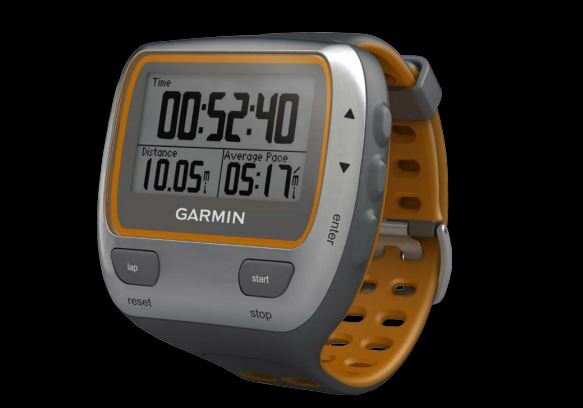 It is water resistant up to 50 meters and has a 20-hour battery life for those long runs. It also can connect with ANT+ devices and wirelessly to Garmin Connect to help you track and share your progress from your computer. Those who need to track more than one type of exercise, the Garmin FR 310XT easily transfers from your wrist to your bicycle. Tracking your swim is no longer impossible with the Garmin Forerunner 310XT, as the watch uses a recent software update to use GPS data to accurately compute the approximate distance you traveled in the water, as well as your average swimming speed. It’s easy to do, too. Simply enable swim mode and hit the start button when you hit the water. Tap the lap button on the way out and your speed and distance will quickly be calculated for you. In addition to calculating swimming speed and distance as well as using GPS to track and map out your runs or rides, the Garmin FR 310XT can also help you track your weight, body fat and water percentages, and six other health measurements when you use it with the Tanita BC-1000 body composition scale. The Forerunner 310XT stores the scale’s readings, then sends it automatically to Garmin Connect. Garmin Connect is one of the best methods to tracking and storing your data. The Garmin Forerunner 310XT uses wireless technology to communicate with any ANT+ device, and then sends all the stored data from your runs, rides, and swims automatically to the Garmin Connect as soon as it is in range. That means you don’t have to worry about connecting your Forerunner 310XT to your computer or losing information that you don’t store right away, because the 310XT takes care of that for you. By connecting to an ANT+ heart rate monitor, you can continually keep track of your heart rate, and that data will be stored along with all the other data collected if you are using a foot pod and cadence sensor. The Forerunner 310XT uses the heart rate tracker along with your weight and other information to create advanced calorie usage calculations. Maintaining a certain heart rate when training is important for gauging whether or not you are exerting yourself too much or not enough. The Garmin Forerunner 310XT uses highly sensitive GPS and HotFix satellite technologies to connect quickly to satellites and stay connected, which ensures that your routes will be accurately mapped out, without having to worry about tall buildings or trees. This is especially good news for those who live in big cities who have problems with GPS signals getting blocked by too many buildings. This training tool is designed specifically for multiple sports, so it transitions effortlessly between your wrist for swimming and running to your bike for riding. You can set it to keep track of your transition times. If you’re looking for a great multiple sport watch that can not only handle the water but also give you a long list of data point, the Garmin Forerunner 310XT is the watch you’ve been looking for. 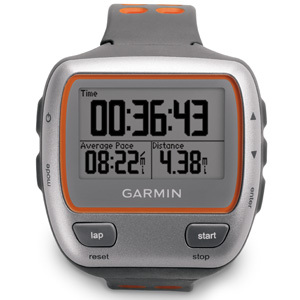 This entry was posted in Garmin GPS Running Watch and tagged Garmin, Garmin Forerunner 310XT.